Every year, our troops usually pick up some new members as they cross over from Cub Scouting and set out on new adventures with us. At the same time, their parents, weary from several years of running everything from pack meetings and outings to fundraisers and banquets, make the decision of whether or not to become active in the troop. Part of that transition involves making what amounts to a 180-degree shift in the adult role, along with a completely new way of doing things for the boys as they go from being led by adults to by their peers. It can not only be extremely bewildering for the new parents, but difficult for those of us in the troop to try to explain it all to them. We try holding parent orientation sessions and writing parent handbooks or new member checklists, but invariably we miss a few things or don’t do a very good job of introducing our new families to Boy Scouts. Enter a new book by the husband and wife Scouter team of Jeremy and Heather Reed titled Beginning Boy Scouts: An unofficial practical guide to Boy Scouting for parents and new leaders. The authors were blessed with eight children, seven of them boys, so naturally they’ve had lots of experience, and from their positions in both a Cub pack and a troop have helped not only themselves but many other parents successfully cross the bridge into Boy Scouting. 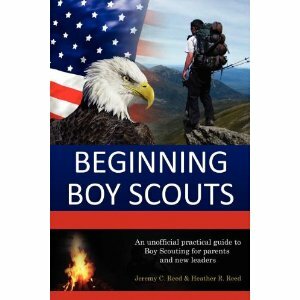 A fairly quick read at 140 pages, the book begins with a brief overview of the BSA’s programs and a short history of Scouting in America, then moves quickly to advice on how to select a troop and the first steps for not only the boy, but also the parent and the potential volunteer leader. A quick overview of the patrol method is next, followed by a listing of the youth positions of responsibility (which, though premature for a new Scout, are useful in explaining the leadership structure of a troop), and a page or two on youth leadership training as well as the patrol leaders’ council. The first four chapters conclude with adult leadership, with sections on the troop committee and Scoutmasters, along with some of the rules of youth protection and a quick look at training available for adult volunteers. Each chapter in the book concludes with a handful of bullet points reviewing the material contained in the chapter. The Reeds continue with the heart of the program: patrol and troop meetings, with examples of typical activities. Courts of honor are discussed along with ways the troop is financed. Uniforming comes next, including “Scout stuff” that a new Scout might need, followed by chapters on ranks, advancement and the merit badge system. There is a chapter listing other awards and recognitions, arranged confusingly in alphabetical order rather than being grouped by Scout, adult volunteer, and troop applicability. The nuts and bolts of Scouting takes up about the first two-thirds of the book. While it’s a lot for new parents to absorb, it’s described in not so much detail as to confuse, but is complete enough that it gives a good introduction. Think of it as “fast start training” for new parents, but one that they can read at their own pace. Probably the most valuable part of Beginning Boy Scouts starts in chapter ten, and it’s the stuff that isn’t mentioned in the official literature: good parent-to-parent advice on how your son can get more out of Scouting. The chapter on “Setting Goals and Keeping Track” advises parents on navigating the early ranks, keeping track of advancement items, and keeping their sons’ interest up. There’s a section on boys older than fifth grade starting Boy Scouts for the first time, and one summarizing the significant advancement requirements that Scouts should have in their sights as they progress. A chapter on camping follows. 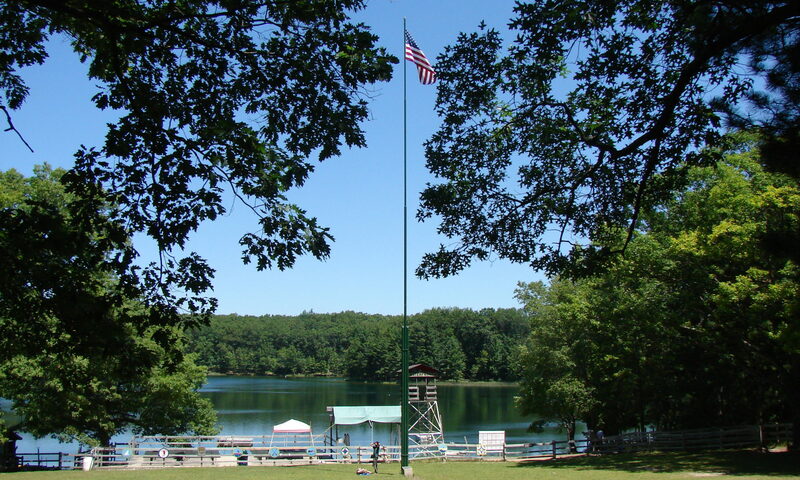 Many families new to Boy Scouts don’t have very much camping experience other than a Cub family camp or two, and others might have trailer camped in state park or commercial campsites.The Reeds do a good job of explaining what Scout camping is all about. They go over the Boy Scout camping program common to most troops, including monthly and long-term camps, the skills and equipment their beginning Scout camper will need, and how meals are done. While the authors don’t specifically address these subjects for adults, much of the same information applies. They wisely advise that you don’t overload campouts with too much adult presence, a mistake many troops often make. A chapter on summer camp and high adventure devotes several pages to the most important outdoor activity in a troop year – summer camp – with advice on how to prepare, how much it will cost, the activities, and the reasons why Scouts should attend. Mention is also made of special events such as Jamboree, local and regional camporees and high adventure that will be available once the boy gets a bit older. The final chapter is devoted to the Eagle scout process. While not a substitute for the many publications on the Eagle rank, it’s a good explanation for incoming parents who are unfamiliar with Boy Scouting’s highest youth rank. There’s some information that I felt was unnecessary for new Scout parents, such as a listing of the various database software available to troops, an issue mainly of concern to the troop committee. On the other hand, information that doesn’t necessarily apply to every troop, included in the interest of comprehensiveness, is enlightening. For instance, the authors frequently point out slight differences in the way the program is used by troops chartered to the Church of Latter-Day Saints, which account for about a quarter of our youth membership. It’s a side of Scouting that most of us in the other 75% never experience. Beginning Boy Scouts fills a need for a not-too-detailed, easy to read explanation of our program for new parents. While experienced Scouters are unlikely to find much that they don’t already know, it’s a wealth of information for those just starting out. I recommend that troops have a copy or two available to loan out to the new parents to absorb at their own pace. Read through it yourself first, of course, so you’ll be prepared to answer any questions that the book doesn’t cover, as well as troop-specific information (you could even publish your own appendix with such details that pertain to your troop). 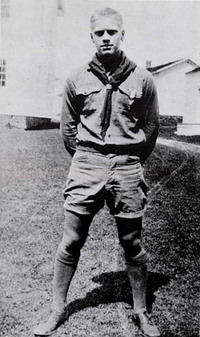 And who knows – you might even learn a thing or two about Boy Scouts that you thought you knew but didn’t!